1/31/16: Eva spent a sunny Sunday morning ice fishing on the Waterbury Reservoir with a crew of local foodies, some of Vermont's finest chefs and a visiting winemaker. Never content to serve a simple wine dinner, Hen of the Wood co-owners Eric Warnstedt and William McNeil set out to plan an entire day around the theme of delectable cuisine, unique wine pairings and an outdoor winter adventure. The festivities began early with Barnaby Tuttle of Teutonic Wine Co. out of Oregon, Doug Paine, executive chef at Juniper in Hotel Vermont and Bleu Northeast Seafood, Justin Wright, chef at Doc Ponds, Drew Robinson of Vermont Wine Merchants, John Abair of Hotel Vermont and Dave Meiss, the bar manager at Doc Ponds. Equipped with a wooden sled carrying wine, vodka, beer, pâté and liverwurst - the gang was ready to hunker down and wait for the fish. 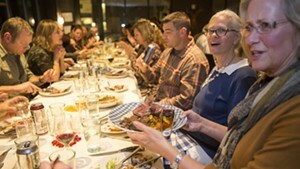 Later in the evening, everyone reconvened at Hen of the Wood Waterbury for a sold out, five-course meal paired with Teutonic wines, oysters and vodka shots served on the outdoor patio and trout and perch caught in Lake Champlain. Easily transitioning from the ice to the kitchen, chefs Doug, Eric and Justin teamed up again to serve an inspired meal. Music: Kelly Ravin. County Tracks, "Water to Wine" and Barbacoa, "Green Olives" and "Chopped and Channeled"